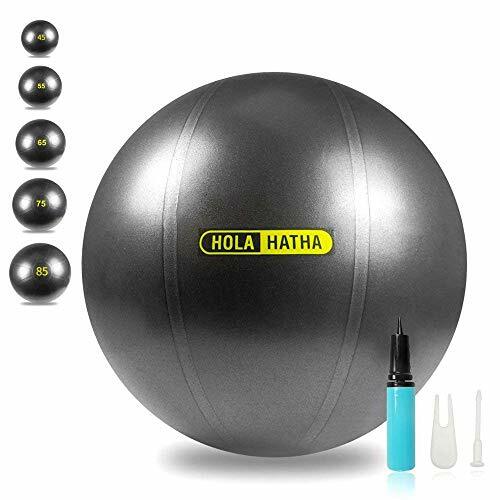 THE BEST WAY TO EXERCISE AT HOME: HolaHatha Exercise Balls give you everything you need to train at home or outside. ANTI-BURST MATERIAL LASTS LONGER: Slow leak technology and matte material prevent injuries and accidents. EFFECTIVE WORKOUTS FOR MEN AND WOMEN: Designed to bear 2000 lbs of weight, our exercise balls are the sturdiest. THREE DIFFERENT BALL SIZES TO CHOOSE FROM: Select from 3 different diameters - 55cm, 65cm, 75cm (small, medium and large). INCLUDES CONVENIENT AIR PUMP: Inflate your exercise ball as needed at home in under 40 seconds!